Patriotic right-wing leader Matteo Salvini is "likely" to be appointed interior minister under a new deal worked out by Italy's victorious populist parties which will allow him to make good on his campaign pledge to expel half a million unauthorized migrants. This was pretty much a coup to save the Euro. Imagine if, after the American election, the electoral collage decided to make Hillary president instead of Trump, despite Trump winning. Imagine further if it cited “protecting foreign investors” and “democracy” as reasons for doing so. This is happening in Italy right now. Regardless, the situation in Italy is not trending in the elite's favor. “An accord has been reached for a Five Star-League government with Giuseppe Conte as prime minister,” the parties said in a joint note on Thursday night, after dropping their insistence on Mr Savona's position. "Maybe finally we have made it, after so many obstacles, attacks, threats and lies," Matteo Salvini, the head of The League, wrote on Facebook shortly after the deal was announced. Mr Conte, a university law professor with no political experience who was plucked from obscurity by the two parties to be prime minster, was summoned to the presidential palace in Rome on Thursday night, where he was given a mandate for the second time to form a government, expected to be sworn in on Friday. Mr Savona is now likely to be given the consolation prize of European affairs minister. The economy portfolio could go to Giovanni Tria, a little-known economics professor. Professor Tria has been critical of the EU's economic governance, but unlike Mr Savona he has not advocated a plan to prepare for Italy’s possible exit from the currency bloc. Instead he has called for a change in the EU's fiscal rules to allow public investments to help growth and, like many mainstream economists, has criticised Germany's persistently large current account surplus. #Italy: Two polls show most Italians want to keep the euro as currency, news agency @Reuters reports. 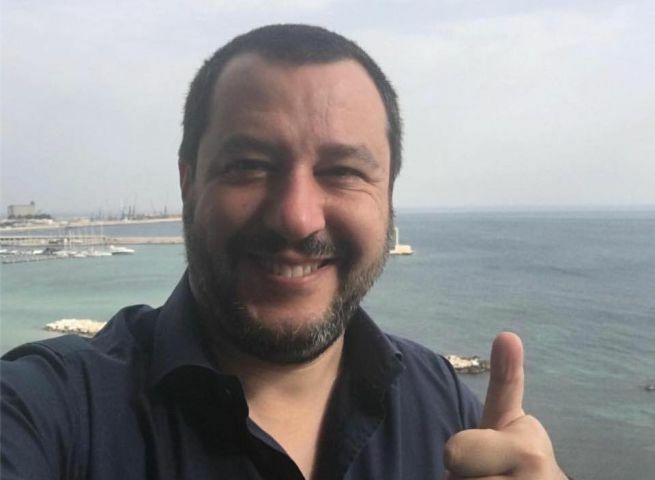 Mr Salvini of The League is likely to become interior minister – enabling him to start implementing his campaign pledge to expel half a million unauthorised migrants from Italy. He has called for repatriations to be dramatically stepped up. A few hours before the agreement was announced, he set the possible tone of his ministry by tweeting a short video of a man who he claimed was a migrant plucking a pigeon on the side of a road. “Final hours of work to form a government, we're putting everything into it. Meanwhile the news takes us back to harsh reality, with an immigrant plucking the feathers of pigeons in broad daylight and in the middle of the street...Go home!" The guy plucks the pigeon then appears to throw its feathers at drivers passing by. Not quite the "doctors and engineers" we were promised by Angela Merkel, eh? Salvini: “It’s now necessary to cut 5 billions in funds directed towards welcoming illegal immigrants”. According to the Five Star-Lega programme, they will be directed towards repatriations instead.